After a marginal distribution of a little over one percent in February, Android Oreo is now on 4.6 percent of Android devices, the highest ever for the current build. This includes the growth of Android 8.0 as well as Android 8.1. Unsurprisingly, the latest Android version isn’t yet dominating the entire Android family. 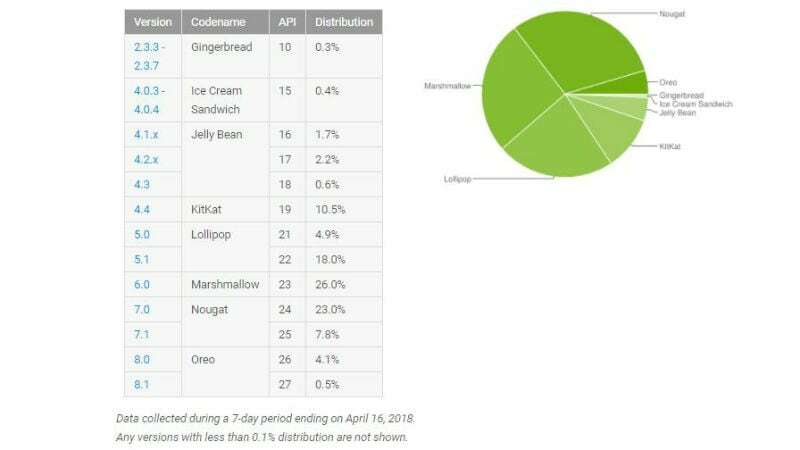 According to the Android distribution chat for the month of April 2018, it is still Android Nougat – comprising Android 7.0 and Android 7.1 – that is leading the entire family with an overall share of 30.8 percent. The distribution chart shows that Android Oreo’s share has increased from 1.1 percent in February to 4.6 percent in April. Android 8.0 has reached the adoption rate of 4.1 percent (up from 0.8 percent in February), while Android 8.1 has grown marginally to 0.5 percent (up from 0.3 percent in February). On the part of Android Nougat, Android 7.0 has 23 percent share (up from 22.3 percent in February), whereas Android 7.1 has 7.8 percent share (up from 6.2 percent in February). After Nougat, it’s Android Marshmallow that is the second most widely distributed Android versions. But interestingly, the distribution of Marshmallow has declined to 26 percent in April from the 28.1 percent share in February. Similar is the case of Android Lollipop, whose distribution in the month of April has declined to 22.9 percent from 24.6 percent in February. The distribution of Android KitKat has also declined to 10.5 percent from 12 percent. Likewise, Android Jelly Bean has reached 4.5 percent in April, down from 5 percent. When it comes to Android Gingerbread, it owns a share of 0.3 percent. This is, interestingly, identical to the Gingerbread share in February. Google collected the data for the distribution chat during a seven-day period ending on April 16. Moreover, the company hasn’t mentioned Android versions with less than 0.1 percent distribution. It is safe to say that those versions are almost extinct in the market today.